Chelsea Clinton was born on 27 February 1980, in Little Rock, Arkansas and is mainly known to people who are interested in politics, as she is the daughter of former US President, Bill Clinton, and former US Secretary of State and presidential candidate Hillary Clinton. Chelsea is now a part of the Clinton Global Initiative, and Clinton Foundation. So just how rich is Chelsea Clinton, as of mid-2017? Authoritative sources estimate that Chelsea’s net worth is over $15 million, earned mostly from her career in the finance industry over the last dozen or so years. 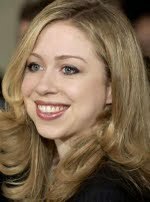 When Chelsea Victoria Clinton was born her father was already the Governor of Arkansas, then in 1993 was elected US President, so Chelsea had nothing like a normal childhood, as with her family she moved into the White House, although both her parents tried to protect Chelsea from the attention of the media as much as they could. Clinton attended the private Sidwell Friends School, after which she studied at Stanford University, from where she graduated with a degree in history in 2001. Chelsea then continued her studies for a Master of Philosophy degree at the University of Oxford, completing it in 2003. Clinton soon started to work at management consulting firm McKinsey & Company, which was Chelsea’s first independent salaried position, establishing her net worth. Three years later Chelsea became a part of the global investment firm “Avenue Capital Group”, and became a member of IAC’s board of directors, and the School of American Ballet’s board. In 2011 Chelsea received an invitation to work at NBC, and appeared in such shows as “Rock Center with Brian Williams” and “NBC Nightly News”. Despite the success she had while working at NBC, Chelsea left the network in 2014, but the job certainly had a significant impact on the growth of her net worth, reputedly having a salary of 600,000 dollars. The following year, Chelsea published her first book – “It’s Your World: Get Informed, Get Inspired and Get Going!”, aimed at introducing middle school students to social issues. This effort has also added to Chelsea’s net worth. Meantime, Chelsea was involved in her mother’s presidential campaign in 2008, travelling the country and talking about her mother’s candidacy, which gave her greater exposure to politics and apparently gaining popularity too. Her subsequent involvement in Hillary’s 2016 campaign was therefore no new experience, although the result was the same. Currently Chelsea has a prominent role in the Bill, Hillary & Chelsea Clinton Foundation, of which she is a board member, and gives paid speeches and presentations, the proceeds of which go to the Foundation. In her personal life, Chelsea has been married to Marc Mezvinsky since 2010; they have a son and a daughter, and reside in Manhattan, New York City. 1 [on the badly-injured 15 year-old Pakistani activist Malala Yousafzai] The Taliban almost made Malala a martyr. They succeeded in making her a symbol. The memoir she is writing to raise awareness about the 61 million children around the world who are not in school indicates she accepts that unasked-for responsibility as a synonym for courage and a champion for girls everywhere. 2 What I would like America to know about my mother and father is that they're great people and they're great parents. 3 We've got to realize we are the future and we make of our future what we make of it, and ultimately we have to do it for ourselves. 4 "I don't even know my phone number." - remark to a friend on January 20, 2001 when she and her family moved from the White House into their home in New York. 5 I'm a big health-food freak and a vegetarian devotee. 1 Long before her mother Hillary Clinton and Donald Trump ever became bitter political rivals, Chelsea was good friends with Ivanka Trump and maintained that friendship by keeping it apolitical. 2 Gave birth to her 2nd child at age 36, a son named Aidan Clinton Mezvinsky on June 18, 2016. Child's father is her husband, Marc Mezvinsky. 3 Gave birth to her 1st child at age 34, a daughter named Charlotte Clinton Mezvinsky on September 26, 2014. Child's father is her husband, Marc Mezvinsky. 4 (July 31, 2010) Married her boyfriend of 5 years Marc Mezvinsky following a 8-month-long engagement. 8 Was friends with Rosamund Pike while at Oxford University. Not only were they the same height (5'9") but both are fluent in German and both are only child. 9 Daughter-in-law of Marjorie Margolies-Mezvinsky. 10 Is a member of the Board of Directors of the School of American Ballet. 11 She trained at the Washington School of Ballet and danced the Sugar Plum Fairy in a performance of Tchaikovsky's "The Nutcracker". 12 Mentioned in the movie Rush Hour (1998). 13 Granddaughter of Virginia Clinton Kelley. 14 She trained at the Washington School of Ballet and danced in performance of the Nutcracker. 16 Named one of People Magazine's 25 Most Intriguing People of 2002. 17 Was named after the annual "Chelsea Flower Show" in London, which her parents visited a year before Chelsea's birth. 19 Attended Little Rock's Forest Park Elementary School. 20 Majored in chemistry at Stanford before switching to history after two years. 21 Dog, Buddy, was killed on January 2, 2002, by a car after he ran into heavy traffic near the Clinton home in Chappaqua, New York. Cat, Socks, was sent to live with her father's former secretary, Betty Currie, in Virginia after her father left office on January 20, 2001. 22 Turned down Harvard, Yale, Brown, and Princeton to attend Stanford University from 1997 - 2001. 23 "Tattler" magazine named her one of Britain's ten most eligible women. 25 Spent the summer of 1999 interning at the N-Bar Ranch in central Montana, where she helped move cattle, sorted pairs, weighed bulls, assisted with embryo transfers, and collected bio-control insects. 26 When Chelsea turned 16, some radio stations in the Washington, DC, area phoned the White House and offered to give Chelsea a new car. The Clintons declined. 28 Had her tonsils removed when she was a child. 29 Her parents gave her a Volkswagen Beetle as a high school graduation present. 31 Weighed 6 pounds, 1 ounce at birth. 32 Was named one of the Ten-Best-Mannered People of 1998 by the National League of Junior Cotillions. 33 Is portrayed as the lead character in the low-budget movie Chelsea's Chappaqua (2000). 34 Named one of the Geeks to watch out for 2000 by Geekfactory.com as part of its annual Geek 100, honoring those geeks who made a difference this year. 35 Chelsea's appearance on the cover of People magazine in February 1999 generated more reader mail than any other cover story in People history. 36 Was named to Richard Selzer's 37th Annual Best-Dressed List. 37 Her Secret Service codename is Energy. 38 Was named Gutsiest Girl in America by the teenage readers of "Jane" magazine in 1999. 41 She was named after one of her mom's favorite songs, "Chelsea Morning" by Joni Mitchell. 42 Named one of People magazine's 25-Most-Intriguing People of 1996. 43 Daughter of Bill Clinton and Hillary Clinton. 44 1997 National Merit Scholar Semi-Finalist. 45 Graduated from Sidwell Friends School in Washington D.C. in 1997, where she was on the varsity soccer team. 46 While in elementary school, Chelsea skipped the third grade. 47 Is an accomplished ballerina, pianist, and soccer player. 48 Had a cat, Socks, and a dog, Buddy. Only negative comments here? She is the daughter of a defacto criminal, who disgrace her self, their family, and the nation. She is the inheritor of this tradition of sleeze, that runs along with bad money. May she leave the nation, and seek a life elsewhere.